Enhance the appearance and value of your watercolors, drawings, prints, or any type of art on paper, by protecting them against dirt, dust, moisture, and handling. 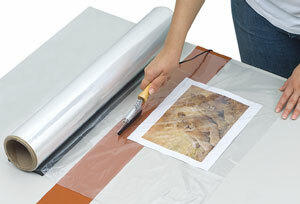 The Mountex Shrink Wrapper Kit offers an affordable option. The unique design of the Mountex film sealer allows you to make a trim seal by drawing it in a straight line, as long as needed. The museum-quality seal lasts for years and the unit is simple to operate and smokeless. The Shrink Wrapper Kit includes a roll of 24"W × 100'L shrink film, a 40W film sealer, silicone pad, film dispenser, and a 115V, 60 Hz, 1200W heat gun to shrink the film after sealing. One-year warranty.